I came across these D Scott Rogo articles on the sadly now defunct site, survivalafterdeath.org; a site I used to often frequent when it was active. D. Scott Rogo, 1950-1990. Was a highly respected writer in the field of parapsychology, the occult, and the survival of consciousness. Rogo served as a visiting researcher at both the Psychical Research Foundation (then in Durham, North Carolina) and the (former) Division of Parapsychology and Psychophysics of Maimonides Medical Center in Brooklyn, New York. He investigated hauntings and poltergeist cases and authored many books and articles on the subject. His writings have been cited in many peer-reviewed parapsychology journals and he was also consulting editor for Fate where he wrote a regular column on parapsychology. On August 18, 1990, Scott was found stabbed to death in his home in Northridge, Los Angeles, California. NO STUDENT of the psychic field can study the evidence for survival without coming to some personal conclusions. Parapsychologists rarely agree on very much and the survival issue is no exception. A few researchers adamantly reject the idea of survival, while a handful of others seem favourably disposed to the notion. The majority of parapsychologists, however tend to remain simply (and safely) agnostic. Because of the very nature of the controversy, any conclusions a student of the field ultimately reaches must be partially subjective and totally individual. The survival issue actually consists of two very separate aspects, since the existence of some sort of life after death does not necessarily imply that communication between the dead and the living is possible. So the controversy can be broken down in the survival aspect proper and its spiritistic corollary. I personally believe that the latter is the more fruitful area of exploration, since any data bearing on it also bears critically on the former. My own sentiments are decidedly favourable to the survival notion, although I am no longer as firm about my position as I was ten years or so ago. There is more and more evidence accumulating to suggest that out-of-body experiences are only rarely veridical; that near-death survivors might be responding to auditory cues (provided by doctors and nurses) when they experience their souls leaving the body; and that deathbed visions could well be archetypal psychological experiences. These lines of sceptical inquiry and thinking have certainly not robbed these phenomena of their importance but they suggest that we should keep our scepticism well-honed. A good lesson might be learned from the mass of research poured into the study of the out-of-body experience during the years following the Kidd bequest. If nothing else, the combined weight of this research showed that the OBE is not as clear-cut and discrete a phenomenon as we had thought. Some of the evidence directly suggested that some aspect of the mind can temporarily leave the body; but the results of other projects failed to isolate anything consistent or measurable about this ‘aspect’. Rarely is anything clear-cut in parapsychology, which is one reason why the survival issue has long remained so controversial. What kind of data can serve as evidence for survival, then? Many researchers believe that no single line of evidence nor single case study can prove the validity of the survival hypothesis. The evidence they argue, must be evaluated as a whole and as an intertwining complex of facts, figures and cases. The crucial issue researchers face today is actually the same one parapsychologists grappled with in the 1880s and well into the 1920s. Do any cases exist that cannot be explained as the result of our own ESP capabilities? The super-ESP hypothesis states that our ESP powers are not constrained by any limiting factors. It may have access to any piece of information or complex of information existing anywhere in the world, it’s past or present. This information can then be processed unconsciously before being presented into consciousness by way of a ‘spiritistic’ message. Spirit communicators, trance personalities and deathbed visions may therefore be projections from our own minds, carefully structured through the collection of psychic information. 1. Spontaneous cases of post-mortem contact in which the motivation for the communication rests more with the deceased agent than with the witness. 2. Cases in which the witness suddenly develops or takes on a skill possessed by the deceased agency. There is simply no evidence that ESP can he used to acquire a skill. ESP is an information channel, while a skill is a learned attribute developed through practice. Two classic cases fitting these criteria exist within parapsychology’s rich literature and a good case for survival could be based on either of them. Probably the most celebrated case of spontaneous contact with the dead was the Chaffin Will affair which was first reported in 1927. The report concerned the North Carolina estate of James L. Chaffin who died in 1921. The terms of his will stated that his property should go to his third son (Marshall), which left his wife and three other sons virtually disinherited. This document was written and witnessed in 1905. The terms of the will were carried out, but in 1925 - four years after his death - Chaffin’s apparition began appearing to one of his other sons, James P. Chaffin, Jr. The apparition materialized by the young mans bedside dressed in an old overcoat he had often worn in life. The figure only spoke on the occasion of its second appearance. Its message was that, ‘You will find my will in my overcoat pocket.’ This overcoat was in the possession of yet another brother. The lining of the coat was sewn up and a handwritten note was found inside which simply said: ‘Read the 27th chapter of Genesis in my daddies old Bible’. The search was on again. The bible was located in the possession of Chaffin’s widow and it was examined in front of two independent witnesses. No one was very surprised when a rough handwritten will dated 1919 was found there. This testament divided the estate equally among the Chaffin children. The will was presented in court, upheld, and the Chaffin estate redistributed. The authenticity of the will was so unchallengeable that Marshall’s family didn’t contest it. Reported in the Proceedings of the Society for Psychical Research, 1927, 36, 517-24. The standard non-survivalistic explanation for this case is that James P. Chaffin simply learned about the will through clairvoyance. His unconscious mind then produced the apparition as a mediating vehicle through which the information could be relayed into consciousness. This theory may seem glib, but it really cannot explain many of the main features of the case. For instance, it can’t explain why the information only emerged four years after Chaffin’s death and not immediately after the terms of the will were first made known, when James P. Chaffin’s motivation to learn about the will would have been at its peak. Nor can any sort of super-ESP theory explain why young Chaffin’s ESP powers focused on the overcoat pocket and not directly on the bible. And why did the communication confuse the message in the overcoat pocket with the will itself? Remember, the apparition said that the will was in the overcoat pocket. This was not literally true. Some commentators on the case also overlook the fact that even after the will was found, the apparition of James Chaffin appeared a final time. He was still apparently concerned about the injustice to his family. Now if we assume that James Chaffin really was speaking from beyond the veil, all the oddities in the case begin to make perfect sense. We know that memory is often a fragile power and that two obviously related memories can easily become confused over time. The deceased Chaffin could easily have become confused between the will and the message he had left in his overcoat pocket. In fact, I feel that this little bit of confusion can only be explained by accepting that James Chaffin’s surviving personality was the source of the information. The survival theory can also explain why the apparition appeared after the will was found … at a time when James P. Chaffin no longer had any need or motivation to produce the apparition. The deceased man may simply have been unaware that the will was now in his family’s possession. Many of these same motivational factors can be found in the Teresita Basa case, where the surviving personality of the murdered woman had a greater motivation to see justice done than Mrs Chua probably did. Mrs Chua hadn’t known Teresita very well and she wasn’t even working at the hospital when the critical messages were received. She therefore wasn’t in any immediate danger from the murderer who was still working on the staff. 1. Rosemary Brown is an English lady who composes sometimes excellent music under the tutelage of Europe’s great composers of the past. She has little formal musical training, yet even many musicologists have been impressed by the quality of her productions. 2. Emma Conti is an Italian psychic who ‘receives’ poetry from the spirit of Emily Dickinson. She has won forty-six literary awards for her poetry, even though she never even attended high school. 3. Matthew Manning is best known today as a psychic healer. When his powers first developed in England when he was a teenager he began drawing detailed and exquisite etchings in the style of several deceased artists. The problem with all of these cases is the same, though. Psychology knows relatively little about our creative capacities, or the nature of unconscious creativity, so it is virtually impossible to trace the true source of these inspired powers. Just because some psychics believe that their creations come from the spirit world doesn’t necessarily make it so. It should be noted, though, that both Rosemary Brown and Emma Conti have purportedly channelled through evidential messages from their ‘spirit’ contacts. There does exist, nonetheless, a very similar case in the historical annals of psychic science that overcomes this problem. The now famous Thompson/Gifford case dates back to 1905. Frederic Thompson was born in Massachusetts in 1868 and worked as a jeweller. He was also a Sunday painter of sorts, though only a mediocre one. Sometime in 1905 he suddenly found his mind and body invaded by a foreign intelligence. He developed an overwhelming urge to sketch and paint and soon began attributing these compulsions to his alter ego, whom he named ‘Mr Gifford’. He adopted the name from Robert Swain Gifford, a celebrated landscape artist whom he had met on two occasions out in the country near New Bedford. These compulsions were often accompanied by visionary landscapes which served as the models for his paintings. Some of the resulting artistic achievements surmounted anything created by virtue of his own meagre talents, but it wasn’t until he learned about Gifford’s death that he became concerned about his sanity. When Thompson discovered that his strange compulsions developed shortly after Gifford’s death, he sought out Professor James H. Hyslop at the American Society for Psychical Research in New York. Hyslop was not too impressed by Thompson’s story and at first believed the case would contribute more to the burgeoning field of abnormal psychology than to psychical research. Despite this, his interest was sufficiently aroused for him to explore Thompson’s claims further. 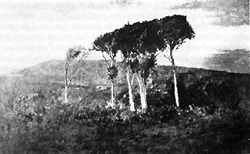 Hyslop was primarily interested in the art work, so in 1907 he took possession of several of Thompson’s paintings and sketches for further analysis. Hyslop, James H. A case of veridical hallucinations. Proceedings of the American Society for Psychical Research, 1909, 3, 1-469. Frederic Thompson’s sketch (above) closely matches the unfinished painting by Robert Swain Gifford, (below) 1907. These paintings became the focal point of the case, for several art experts who saw them spontaneously remarked on their similarity to the work of the late R. Swain Gifford. But the true denouement of the case came when Hyslop and Thompson began exploring the life and work of the deceased artist. They eventually discovered that some of the sketches now in Hyslop’s possession matched unfinished paintings left by the artist at the time of his death. They were still in the possession of his widow, who had never shown them publicly. She had kept them at their long-time residence on a privately owned island just off the New England coast. 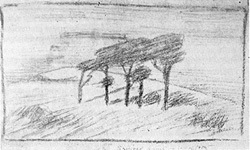 Some of Thompson’s other sketches were of actual locations later found on the island. The strange case of Frederic Thompson is more complex than any brief summary can communicate. Professor Hyslop was also experimenting with several trance mediums in Boston, New York and Virginia during these months. He began receiving several evidential messages from R. Swain Gifford, while Frederic Thompson found himself suddenly undergoing odd out-of-body experiences. It looked as if the deceased artist was trying to prove his identity through any channel available to him. My own opinion about this extraordinary case is fairly clear-cut. Even if we entertain the possibility that Frederic Thompson was a powerful psychic, there seems no motivation for why he suddenly assimilated Gifford’s personality in so bizarre a manner. The deceased artist would have had a greater motivation to continue on with his work, and naturally he would have chosen a fellow artist (of sorts) whose hand he could most readily guide. It is also hard to fathom why Thompson began undergoing out-of-body experiences during this time, though this development is perfectly explicable if we assume that Gifford was attempting to control and possess him. The connection with Gifford’s sudden intrusion in his life also explains Thompson’s sudden artistic genesis. Impressive reports of similar cases of ‘spirit’ return highlighted the early literature of psychical research. It is certainly a pity that cases of similar quality are uncommon today. This may result from the fact that contemporary parapsychologists simply aren’t as interested in ferreting them out and investigating them as were the founders of the field. I can well imagine how a researcher today would respond to the claims of someone like Frederic Thompson. The whole case looked very much like one of bizarre psychopathology. The psychic underpinnings of the events were only revealed because Hyslop decided to explore the case in further depth despite his initial cynicism. Researchers today rarely have the time or inclination to look into such cases so thoroughly. It is certainly interesting and revealing that not a single parapsychologist investigated the Teresita Basa case even after it had achieved nationwide publicity! 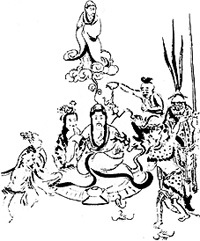 Descriptions of death and survival are consistent across cultural frontiers: this anonymous Chinese print (below) shows the astral body separated from the physical body but still connected by a cord. Just about the only contemporary researcher interested in studying cases bearing on the survival issue is Dr Ian Stevenson at the University of Virginia. 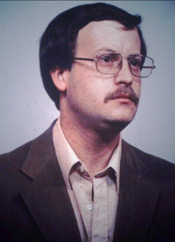 Since he has been focusing on reincarnation-type cases, his contributions to other areas of survival research have been minimal. Recently, though, he and his colleague Dr Satwant Pasricha, have issued a report on a third case for which only the survival theory seems a tenable explanation. This report concerns the strange trances of Uttara Huddar, a teacher and administrator in Nagpur; India. She has been undergoing episodes since 1973 in which she takes on the personality and ‘becomes’ a woman named Sharada who lived in nineteenth-century Bengal. These trances can last from a few hours to several days and ‘Sharada’ has communicated a number of details about her life and her relations. Detailed genealogical research has proved that many of the names she has offered designate people who really existed in the Bengal district years ago. It is extremely doubtful that Ms Huddar could have had access to this information. ‘Sharada’ also speaks in Bengali, which is a dialect distinct from the Marathi tongue spoken by Ms Huddar. Experts have testified that Sharada speaks the language correctly and uses a vocabulary consistent with someone from the nineteenth century. Ms Huddar apparently once had some passing familiarity with written Bengali script, but not with the spoken language. Stevenson, Ian, and Pasricha, S. A preliminary report on an unusual case of the reincarnation type with xenoglossy. Journal of the American Society for Psychical Research, 1980, 74, 331-48. The case of Sharada’s uncanny return is still unfolding and it is destined to become a classic. The only problem is whether or not it is an example of reincarnation or genuine spirit possession. Dr Stevenson prefers the former theory, although any decision on the matter would be arbitrary. The important point is that some form of survival is implied by adopting either explanation. What aspect of the personality actually survives? Do we possess a soul, or is just a complex of personality traits and drives released at death? Do we survive death permanently, or do we undergo a second and more permanent annihilation? What is the nature of the ‘next’ world? These are the true essentials of the survival issue, but they are issues upon which parapsychology has little right to comment. Precious little evidence from the field’s past or present literature sheds any light on them. To me, the greatest mystique of the survival controversy is just this fundamental impenetrability. Because of its very nature, I doubt if the issue will ever be resolved to everyone’s satisfaction. That time will only come when we discover a reliable method by which we can consistently contact the dead, and that day will probably never come. It is obvious that the human mind is too complex and inconsistent a tool to use, but nothing better seems to be on the immediate horizon. So parapsychology’s best bet would be to explore further those lines of evidence already under consideration. There is still much we need to learn about trance mediumship, near-death and related out-of-body experiences, deathbed visions and cases of the reincarnation type. Perhaps some day a case of post-mortem contact will come to light so staggering and impressive that whether we survive the shock of death will no longer be in question. But I can’t honestly say whether this is a genuine possibility or merely a momentary exercise in unabashed speculation or optimism. The case for survival is impressive but not yet proven. The above article was published in D. Scott Rogo’s Life After Death. The Case for Survival of Bodily Death (London: Guild Publishing, 1986).